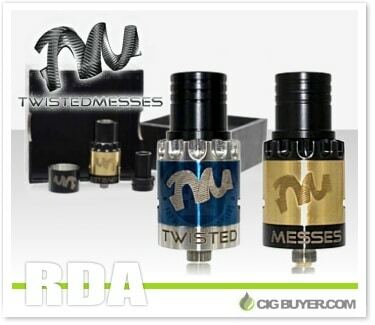 Featuring some of the largest post holes in any 4-post RDA (2.8mm each), the Twisted Messes RDA is fog making machine! Created by CompVape with the help of coil building guru Twisted Messes, it was specifically developed to house massive coils and chuck major clouds. It has a beautiful, mirrored SS body, with a four post build deck that can fit almost any configuration. It includes PEEK insulator with a 6mm deep juice well, adjustable airflow and an adjustable, silver-plated 510 center pin. Plus, it comes with three drip tip / chuff cap options and a removable outer airflow ring.